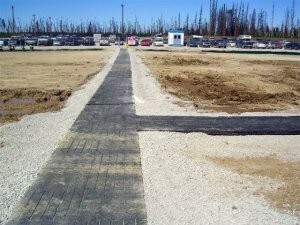 Eco-Flex manufactures the industrial rubber EcoWalk sidewalk that is comprised of 65 recycled Alberta passenger rubber tires. The safety benefits include an anti-slip durable surface, resistance to fire, low tripping hazard, resistance to snow and ice buildup, and a low static electricity discharge. This product, like many others manufactured by Eco-Flex, provides a solution for companies and industries looking for green environmental solutions.